Some friends of my parents took our family to The Bell, a nice old inn located who-knows-where. My school uniform was the closest thing I had to a suit that fit (I grew six inches that year), so that's what my parents had me wear. My grandparents had me sit for a portrait. My grandmother still has this hanging on the wall over four decades later. She's wonderful. I was experimenting with some photographs one evening. This was taken in my basement office at home and is one of my favorites. I was just wondering if anyone wanted to go for a walk after dinner. Or watch a movie. Or something. Posing for a portrait that was made for my grandparents, who were still thrilled by their first grandchild, even after two years. We enjoyed being married so much, we did it twice. I often take pictures of other people taking pictures. This time, it's my reflection in my office window. Movement III (Song of the Blacksmith) from Gustav Holst's Second Suite for Military Band in F major, in case you're interested. The program for this concert is available at the FCB website. Out standing in his ... oh, nevermind. Sometimes, a good pun is hard to resist. Arriving at a wedding reception in Pensylvania's beautiful York County, I took a moment to pose in a field with the rolling hills behind me. Don't mess with me -- I've got pliers. 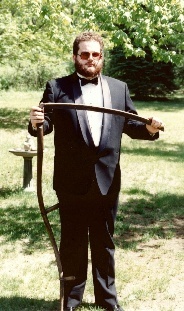 Several of us at this wedding reception had pliers. (It's a techie thing.) Mine were the smallest pair . . . but don't you dare underestimate them! I dressed up for a Linux convention and was surprised to be the only person at the convention to have a red hat. Amazing, considering that Red Hat Linux is possibly the most popular Linux distribution. Sharing a comment with a friend at one of the FCB's annual Valentine Dinner/Dance events. Most of my summers, for the first 25 years of my life, were spent at my grandparent's place on the west shore of Houghton Lake. This photo was from the summer of 1970, just after we'd moved back from England. Taking a moment to relax at a baptism party for Emily Ifverson.